You are currently browsing the tag archive for the ‘hillbillies’ tag. Bugs Bunny is on holiday in the Ozarks, Arkansas, where he meets two dumb and bearded Hillbilly brothers with ridiculously long guns. 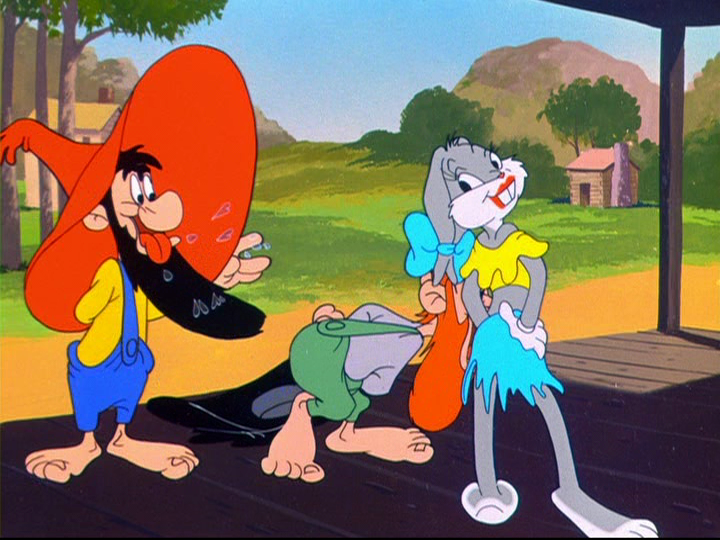 When they both chase him, Bugs dresses as a country girl and invites them into a square dance. Soon, Bugs takes the fiddle himself, making the two brothers hurting each other while dancing in a long, catchy and funny square dance sequence. ‘Hillbilly Hare’ is one of McKimson’ all-time best Bugs Bunny cartoons, and certainly his most musical one. Throughout the picture, the animation is delightfully silly and over-the-top.